That humor was brought to you by my hilarious husband, Macky. I am a little embarrassed that I didn't come up with it myself. This may surprise you, but I have not always been a vegetarian. When I did eat meat, I wasn't a huge fan but I did have a couple exceptions - one being corned beef. 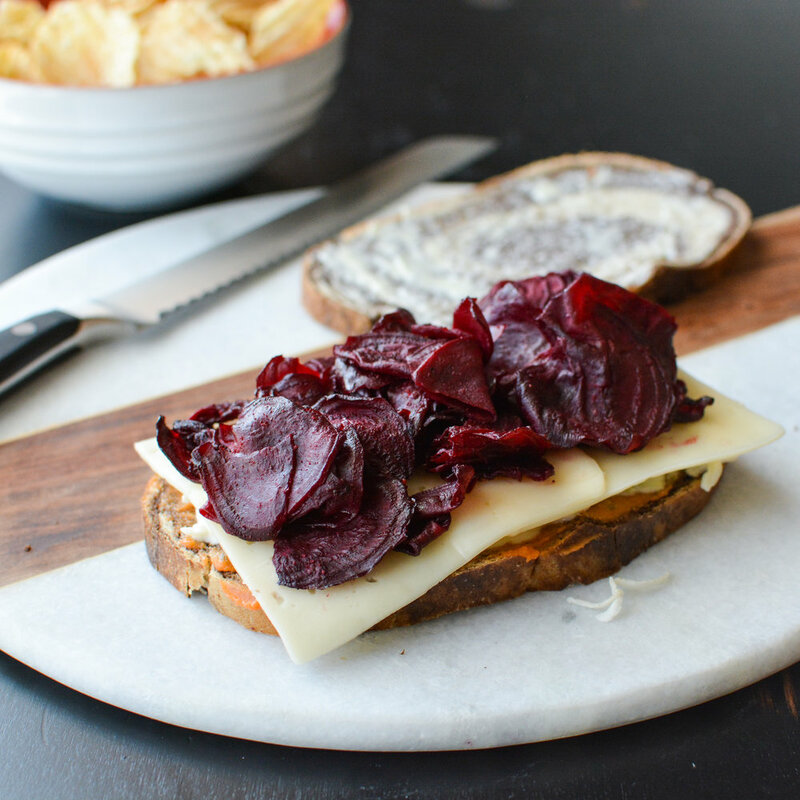 I wanted to create a corned beef substitute and from there I came up with the Beet Reuben. 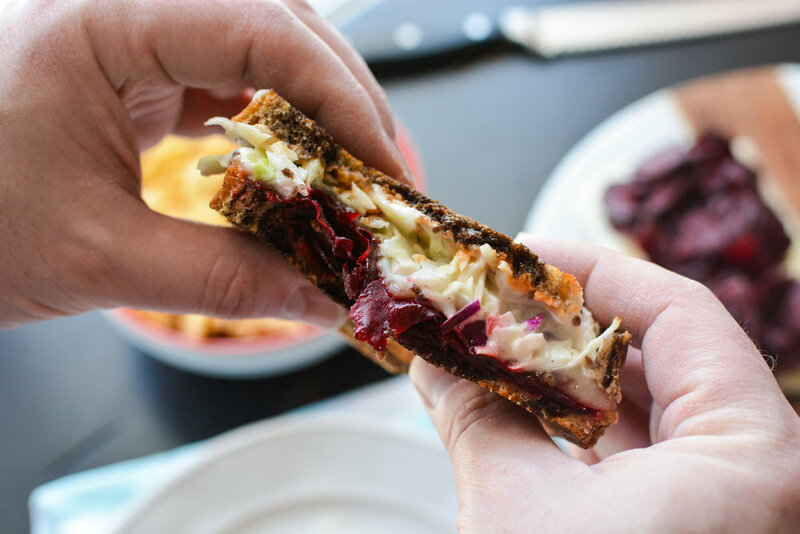 Two pieces of rye bread hold together thinly sliced savory-sweet seasoned beets, creamy coleslaw, melted swiss cheese and a thousand island inspired spread made from tahini. It's quite possibly the furthest thing from a classic reuben, but it's so delicious and lovable in it's non-traditional form. In my book, that's all that matters! 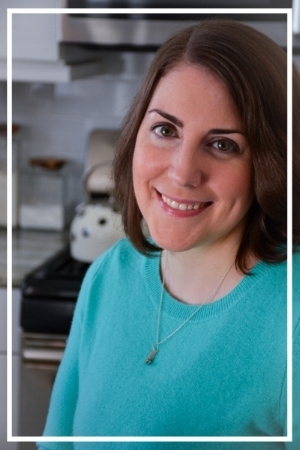 Please don't be intimidated by the long list of ingredients. A lot of spices go into making those beets just right. The coleslaw and tahini sauce are easy to whip up but you can always use pre-made coleslaw or thousand island dressing. If you follow me on Instagram, you'll remember seeing me boiling a mysterious pot of red water. Surprise! They were beets! Hilariously, I didn't end up going with the boiling method of cooking. I found it was best to use raw beets, slice them super thin, season with ground pickling spice flavors and roast them until they are the perfect texture. Behind the scenes - Macky and Caleb being silly during my photoshoot!